Understanding the role of the mycobacterial envelope in pathogenicity and targeting this particularly low permeable structure represents a key step towards anti-TB therapy. This requires, however, the structural determination of its individual components as well as their mapping, organization, and roles. 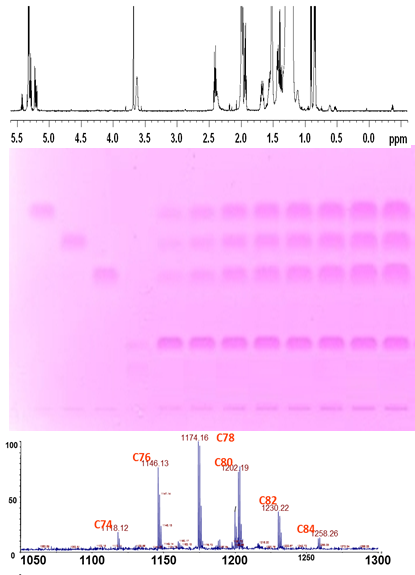 Our expertise in structural determination allows us to take the lead in detecting, quantifying, characterizing and disclosing biological activities of many lipids and glycoconjugates of the mycobacterial envelope. Among them: essential mycolic acids (α-alkyl, β-hydroxylated very-long chain (up to C100) fatty acids containing various decorations), phenolycolipids (PGL), phthiocerol dimycocerosate (DIM), capsular alpha-glucan, lipopeptides, phtiocol, trehalose-polyphleates (PPT), -monomycolate (MMT) or –dimycolate (DMT), lipooligosaccharides (LOS), and others. The biosynthesis and the biological activities (permeability, virulence,…) of these constituents are investigated going through obtaining and analyzing mutants. How do these components organize? 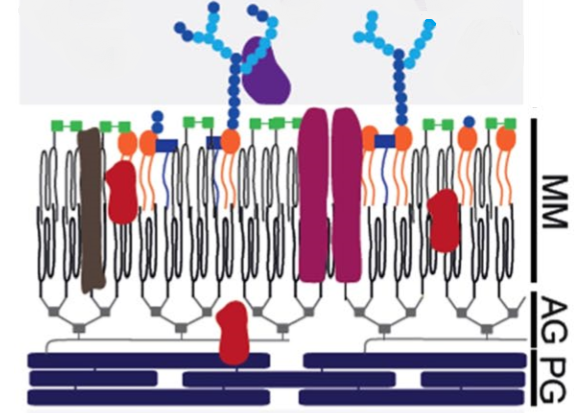 Our demonstration of the occurrence of a capsule layer above the mycobacterial cell wall, and of an outer membrane (called mycomembrane, MM) now enlightens some of the unique properties of mycobacteria, such as their very low permeability to nutrients and hydrophilic drugs. Although many constituents of the mycobacterial envelope have been described, the question of their specific location, where and how, remains to be elucidated. To address this question, we developed methods to isolate the capsule and MM-containing cell wall fractions and their constituents. Their analysis helps understanding how the different molecules can organize within the envelope. Laneelle et al. (2013) Structural elucidation and genomic scrutiny of the C60-C100 mycolic acids of Segniliparus rotundus. Microbiology 159 (Pt 1):191-203. Daffé, M, Crick, DC, Jackson, M. (2014) Genetics of capsular polysaccharides and cell envelope (glycol) lipids Microbiol Spectr., 2, 1-46.